After my day of contemplation at Lac du Pelleautier, I decided to go down to Gap for a change of scenery, visit the laundrette, and find a decent 3G signal to play internet poker. I wanted to get projecting out of my mind for a while, let my body recover, and wait for cooler weather. I didn't have to wait long - after 3 rest days the temperatures were forecast to drop by around 7 degrees for two days. I headed back up to Sigoyer on the evening of the third rest day feeling pretty psyched. Gerd was back for a quick visit and he also had unfinished business with Makach Walou, so we headed up to Berlin at lunchtime to eat, rest and get ready for good conditions. Around 4pm the temperature started dropping rapidly. I knew I should probably wait a little longer, but I was itching to see what shape I was in, so I jumped on. The holds were a little greasy, but I got as far as the crux feeling good. I gave everything a good clean and Gerd got on - sending for his warm up and looking really solid all the way. 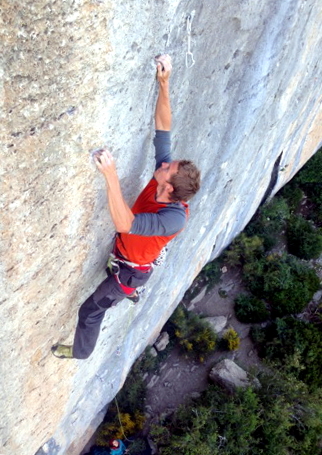 He followed that by closing out the cruxy Queue de Rat (7b+), a strong day coming back so recently from injury. I had another two burns, falling on the same move each time. I came down in a state of confusion. I'd been through that crux before but now, in perfect conditions, I was dropping it every time. Was I not as well rested as I felt, or had I just developed a total mental block around that move? As I voiced my frustration, a French chap who had sent the route earlier came over to ask how I was taking the crux hold. He told me he was using it differently; I decided to stick with my beta for the next attempt and then try his method if I fell. I did fall once more, but as soon as I tried the new beta I knew it should be the last time. It was getting dark and I was tired, but in my excitement I tried to squeeze in one more effort. This time I didn't get as far as the crux, but it didn't matter... I fairly bounced down the hill that evening, knowing I had one more day of weather window and some crucial new beta. I headed up with Will Oates the next afternoon, he wasn't so psyched for spending the whole day at Berlin so we decided to warm up elsewhere and come back when the conditions were at their best; after food and a good rest we headed round to Demi-Lune and I got on a bouldery 6c called Bonnye and Clyde to warm up. I ticked it first redpoint, and although I'd failed the onsight, it gave me a boost because I'd pulled on much smaller holds than I would find on Makach and the injured left arm felt good. I could feel the nervous excitement building, it really was on now. I had to find a way to lower my expectations. There was a strong Spanish climber on the route as we approached Berlin - he got the onsight, and came off without cleaning the holds. It was perfect - I told myself "there's probably been three or four folk on here already and the crux will need a clean - you're not going to send, just get up there and try out the new beta". It worked, and I felt pretty calm as I tied in and pulled on. After somewhere in the region of 60 or 70 attempts, I've never had a route so well dialled - the climb to the crux went like clockwork and with the new beta I pulled through it almost effortlessly. There's a half-decent rest at the next clip, but I felt good so I didn't hang around long. The next 5 moves flowed as smoothly as I'd ever done them off the rope and I was into a huge jug with a couple of meters of easy climbing to go. I could almost hear Jill's voice saying "after that jug, just don't forget how to climb!". I took a deep breath and didn't forget. I've never felt so emotional after a sport climb. It wasn't a first at the grade, but it was the longest and hardest project I've been on. I learned a lot about my climbing in the process and I had to dig in when injury and common sense were telling me it was getting too much; I hope that experience will stand me in good stead when I'm getting shut down in future. 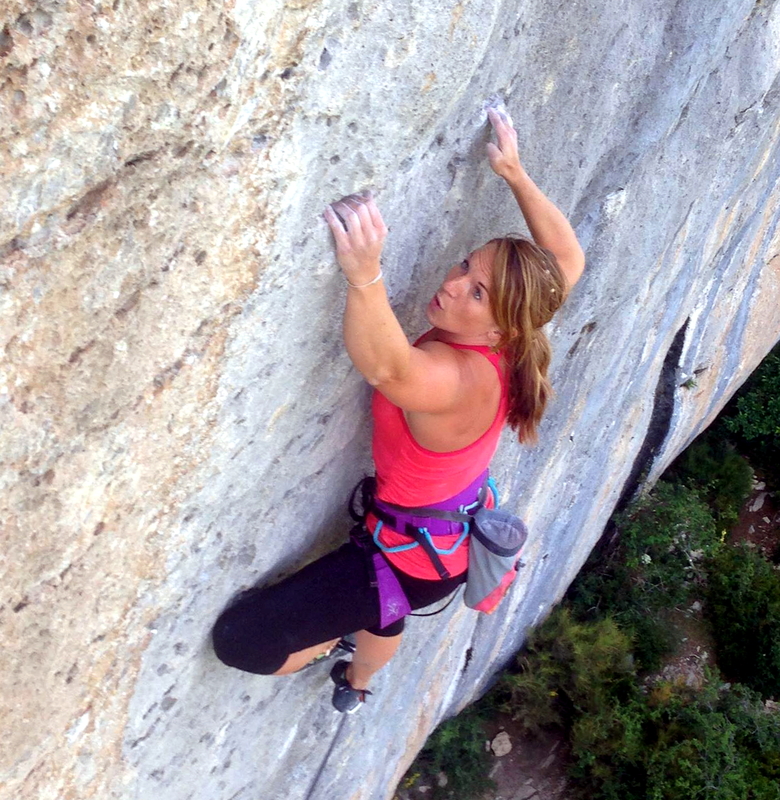 Later that evening, whilst falling off an onsight attempt of the stunning 100 Patates (7b) I heard Ali yelling in delight as she closed out her long term project of La Petite Illusion (7a+), and then Will flashed 100 Patates to round of a rather splendid couple of days at the crag. Jill focused on nailing the crux... she crushed Makach early and left me in her wake. 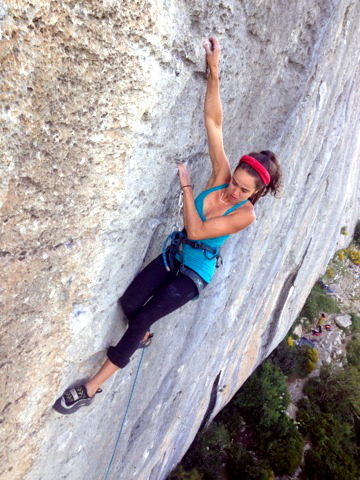 Kat working the top moves - this balancy sequence was one of the most satisfying pieces of rock I've climbed. Gerd pulling through the crux. Ali also showed great determination to keep projecting and send La Petite Illusion. Learning my lessons in Céüse.